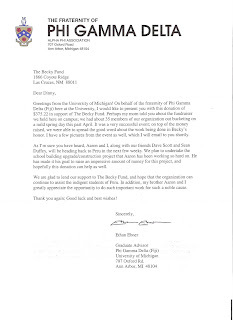 Thank You Phi Gamma Delta (U of Mich)! As I am sure you have heard, Aaron and I along with our friend Dave Scott, and Sean Duffy, will be heading back to Peru in the next few weeks. We plan to undertake the school building upgrade/construction project that Aaron has been working so hard on. He has made it his goal to raise an impressive amout of money for this project, and hopefully this donation can help as well. We are glad to lend our support to The Becky Fund, and hope that the organization can continue to assist the indigent students of Peru. in addition, my brother Aaron and I greatly appreciate the opportunity to do such important work for such a noble cause. Thank you again; Good luck and best wishes! I asked my friend Toby to write the report this year for a fresh perspective. She and I were on the very first trip when we "made it up as we went along". Those ideas have been expanded and refined, but we continue the original mission. The report is a little delayed as Toby was busy welcoming her first grandchild. Thanks again for your continued support. As long as we have you, we will continue this work. Indeed it is……and very successfully thanks to all of you and your generous donations. 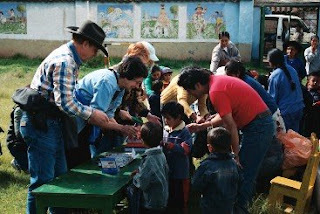 The BECKY FUND celebrated its fourth annual working visit to the Calca-Pisac area in April, 2007. We had a dynamite international crew this year. From up north came Becky’s mother, La Senora Diana and her amiga, Molly, Las Cruces, NM; Tio Peter and Tia Anna, Ennis, MT; amiga Ann and her hija Marie, Boston; amiga Toby (that’s me) from Spokane, WA. Crossing the Pacific all the way from New Zealand came Tia Cristina and Tio Ross, prima Britt and their amiga Jo. Down south, the Wilson family - Hernan and Yolanda (Yoli) in Calca, Carlos and Ligia and Richard and Sandra in Cuzco - are rock solid as our Peruvian anchors. Their commitment to THE BECKY FUND, invaluable contacts andYoli’s magic menus each afternoon remain fundamental to our collective success. 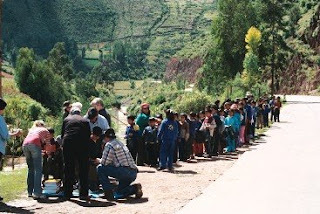 As in past visits, the primary thrust was providing school supplies to the children and their teachers in the high mountains around theCalca-Pisac area……. and so it was again this year. Off we went each morning: Justo, our fearless driver at the wheel of his trusty van: Hernan riding shotgun with the map and directions. Loaded from top to bottom with notebooks, rulers, pens and pencils, erasers, glue and tape, paper for creative projects and writing exercises, story books and dictionaries, colored pencils and Magic Markers, maps and posters, scissors, tempura and paint brushes, puzzles and puppets, towels and soap to introduce the rudiments of basic hygiene, netting filled with soccer and volleyballs, clothing collected at home to hand out where needed most, stacks of pancitos – the traditional whole wheat rounds of local bread, the BECKY BUNCH was a familiar sight heading out of Calca. We climbed the highest mountains as far as we could go. We forded rain-swollen streams and roadways, dodged llamas and their tenders, wedged in the locals if they needed a ride and hung on tight as we pitched into and out of the deep ruts and giant potholes on most certainly these roads less traveled. If the schools were still too remote or the track too primitive and muddy,Justo simply found a wider spot on the mountainside and we waited for the teachers and students to come to us. When we finally tallied all those teachers and schools, teachers who waited patiently each afternoon at our Calle Jacaranda house, teachers we met on the road or at the market, teachers we met on previous visits and knew we were returning, students on the road, little people with their moms at the schools when the BECKY BUNCH drove through the school gate………..well, the numbers were truly extraordinary, the gratitude immeasurable. THE BECKY FUND gave basic school supplies to at least 4,000 students in dozens of schools, assembled more than 200 teacher’s boxes and handed out at least 5,000 whole wheat pancitos. Teachers told us again and again that what THE BECKY FUND provides is often what they have to work with for the entire year. Without these materials, their jobs and the fierce dedication to making the lives and futures of these mountain children and their families just even the tiniest bit better would be virtually impossible. Each trip would not be complete without a stop at the SCHOOL FOR CHILDREN WITH SPECIAL NEEDS in Calca. This is a toughie, indeed. Regardless of the limitations and the profound need beyond anything possible within the walls of this modest facility, the director and her staff are totally committed to these children. Books and pencils are welcome, but as important is warm clothing. As we waved goodbye, the little group at the door waving back sported toasty sweaters and winter jackets. 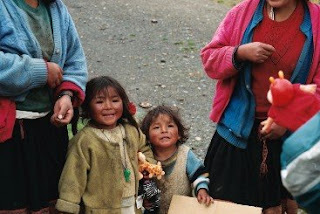 Not by books or bread alone, The BECKY FUND also shopped in the Calca market for brooms and buckets, cooking pots, protein powder to supplement grossly inadequate diets, cups by the dozen, tire pumps, even a gas ring and propane tank. All BECKY FUND monies are spent in Peru. These purchases, large and small, have significant impact on the regional and local economies. They also create jobs and hope. Literally because of a terrible fall last year and Tio Ross’ broken legs, the New Zealanders arrived this year with a huge bag of orthopedic supplies thanks to Ross’ very generous orthopedic surgeons. Word travels quickly in the world of need and pain: Before long, old men and women were hobbling away from our gate, standing a little straighter, the new braces, canes and crutches replacing their primitive wooden sticks. school was renamed to honor Becky; A special Mass was dedicated to thank THE BECKY FUND and its work. Teachers, students, people we didn’t even know came daily to offer tokens of their appreciation. As successful as THE BECKY FUND is, there is so much more to do. Basic nutrition, medical care, family services and children’s rescue are increasingly urgent. 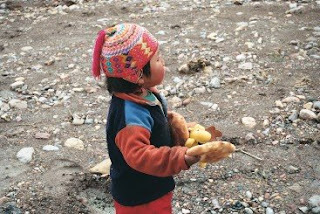 THE BECKY FUND is taking a look at these areas, too, and if there are others in the Sacred Valley who share the same values and concern. projects. There are no administrative costs or fees. Each person on each visit pays his or her own expenses. We thank you again for your past generosity. We ask that you continue your support for the work that lies ahead. Celia, one of the Calca market vendors, has become a good friend of Dinny’s. We arrived just as Celia and Hugo were finalizing their wedding plans. They asked Tia Cristina and Tio Ross to be the nuptial sponsors and Dinny to be Godmother to their 12 year old son. Everyone agreed. The BIG DAY arrived. Off we all went to the ancient chapel in the little town of Lamay just down the road from Calca. The bride was beautiful, the groom so handsome, the flowers lovely and the decorations simply gorgeous. There were tears, applause, hugs and kisses all around, rice in everyone’s hair, a fiesta awaiting us back in Calca. It was not until we left the chapel that we realized that all the lovely swags and bows were made out of……white toilet paper…….and that many guests were carefully rolling up the tissue and tucking it into their pockets. So simple, so beautiful and so very-very practical.